Crouched in the shadow of a Portuguese fort on the opposite, northern side of the headland from Vagator, Chapora, 10-km from Mapusa, is a lat busier than most north coast villages. Dependent on fishing and boat building, it has, to a great extent, retained a life of its own independent of tourism. The workaday indifference to the annual invasion of Westerners is most evident on the main street, lined with as many regular stores as travellers cafes and restaurants. 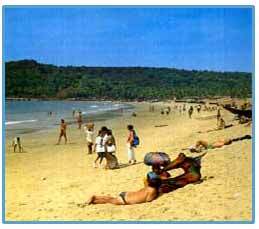 It's unlikely that Chapora will ever develop into a major resort, either. Tucked away under a dense canopy of trees on the muddy southern shore of a river estuary, it lacks both the space and the white sand that have pulled crowds to Calangute and Colva. If one has one's own transport however, Chapora is a good base from which to explore the region: Vagator is on the doorstep, Anjuna is a short ride to the south, and the ferry crossing at Siolim --gateway to the remote north of the state - is barely fifteen minutes away by road. The village is also well connected by bus to Mapusa, and there are plenty of sociable bars and cafes to hang out in. Apart from the guesthouses along the main road, most of the places to stay are long stay houses in the woods. Finding somewhere to eat in Chapora is easy: just take a pick from the crop of affordable little cafes and restaurants on the main street. The popular Welcome, halfway down, offers a reasonable selection of inexpensive and filling seafood, Western and Vegetarian dishes, plus relentless reggae and techno music, and backgammon sets. The Preyanka, nearby, is in much the same mould, but has a few more Indian and Chinese options. If one is suffering from chilli burn afterwards, Scarlet Cold Drinks and the Sai Ganesh Caf�, both a short way east of the main street, knock up deliciously cool fresh fruit milkshakes.